It was almost six years ago when I wrote about hill sprints and simplicity at the link below. In the years since, that old entry has been viewed thousands of times by readers around the world. To this day, I still receive an occasional comment or question about it. Most of the feedback is related to hill sprints or running. Ironically, perhaps the most important paragraph within the entry is rarely discussed. Within the last paragraph, I wrote about a friend of mine who at the time was in his late 40s. He is a former fighter who stayed in excellent shape with what many would consider a basic routine. When I was last in contact with him, his routine consisted of a strength workout on day one, hill running and calisthenics on day two, and a boxing workout on day three. He would repeat this three day sequence twice a week. He went on to say that he no longer has access to free weights. Instead, he has been working with a weighted vest. He wears it for exercises such as pull-ups, pushups, dips, squats, and lunges. A strength workout for him consists of a few sets wearing the vest and then a few sets without it. He averages two weighted vest workouts each week in his basement. He has also maintained his running but has shifted towards more trail work. He likes running the trails and will usually do a few sets of calisthenics before or after the run. He also does the same boxing workout once or twice a week which consists of shadow boxing, punching the heavy bag, and skipping rope. Believe it or not, there is a point to this entry. I’m not just writing to let everyone know that I bumped into an old friend over the weekend. Instead, the message that I hope to convey is one that I’ve shared many times before. In short, complex routines are not necessary for general health and strength. My friend is in his 50s and could hang with most healthy adults who are half his age. Ironically, he has maintained his ability with a routine that many fitness professionals would surely critique. My friend doesn’t care about periodization, restoration, variety or any other industry buzzword. In fact, he doesn’t even have a computer. He told me that his hard drive crashed sometime around 2012 and he had no reason to purchase another. Therefore, he’s obviously a guy who doesn’t wait until Monday morning to read the latest breakthroughs in the fitness industry. He doesn’t subscribe to any newsletters and has probably never read a scientific journal in his life. And while his routine and philosophy may seem archaic, the results are impossible to deny. This man’s consistency and diligence have proven to be invaluable. He is in tremendous shape in his 50s and doesn’t pay any attention to the modern fitness industry. His comments about the industry were actually quite classic, but are probably something I shouldn’t share here to avoid any lawsuits. In summary, it was certainly great to catch up with an old friend. It is always refreshing to see an example of hard work, consistency, and simplicity. Such attributes will never receive too much attention from this revenue-driven business, but we should never forget their relevance. Our ability to get in shape is not nearly as complicated as many would like us to believe. Fancy equipment and routines are far from necessities. Plenty can be accomplished with even a rudimentary program as long as you are committed to pushing yourself. This is the article that sticks in my mind the most from your blog Ross. In particular the bit about the guy you are talking about. It has become my method of exercise since I read it first and I don’t see any need for that to change. I too am in my 50’s and find that this simplicity allows me to live as I want and do what I want physically. Win win ! It’s articles like this that I could read all day. It just goes to show that once again consistency is the key to all. It’s just a reassuring feeling to hear it repeated especially with all the commercial bs that’s out there.. 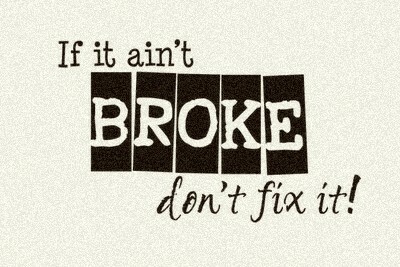 If it ain’t broke don’t fix it! Seems to me the problem lies with people not even knowing the basics of how to keep themselves fit… Times have changed, older generations knew how to keep fit, people moved more on the whole and were generally fitter. There has been recent news coverage on how a BRISK 20min walk a day will keep humans from an early grave. It’s reported that lack of exercise is twice as likely to lead to an early grave than obesity. Lots of modern folk are not even walking, let alone getting stuck into a decent exercise routine. Perhaps this is due to to the modern way of life. Cars, computers, office jobs, elevators, cell phones, internet, TV, etc. etc. The easy, comfortable way of life has its price and it seems that price is an early grave! How to keep fit should be common knowledge, we should all be taught these skills from an early age. Just like learning to read and write etc. Schools, parents and the like have a responsibility to instill this into children. Solve the problems before they arise rather than deal with the consequences later in life. This is what is broken… the fact that a majority of people have no idea how to keep themselves healthy or if they do they choose the easy options in life instead. Exercise isn’t complicated, look at kids and learn from them… They know how to play and have fun, they love to climb and fly and run, they are limited only by their imaginations. Kids don’t turn to books when they want to sing or dance, they just get on and give it a go. It’s only as they get a little older that some of them forget that life can be fun if you just give it a try. Books and experts help to bamboozle adults, creating in the process ‘Paralysis by Analysis’… the internet has increased this ten fold. Move, walk, run, do press-ups, pull-ups, jump rope, basketball, football etc. There’s a whole host of simple things that anyone can do to keep fit. Ross has mentioned over and over how to do it. Hill Sprints are far one of the top conditioning exercises. The only thing better is wrestling. This is very much true, your articles conveys an extremely important message ! I always love hearing stories like this. It’s sad how “normal” people see those of us who live such a lifestyle as crazy but it’s totally ok to be an inactive slob with the rest of the heard. Im 15 woukd a simple routine work for me to i always wanna workout and then enjoy life after words I don’t wanna be stuck in a gym all day. however back to you point: I tried commercial gyms and although always put my commitment in 100% I did not enjoy it and stuff that gets touted about. simple/ 1000% more fun than gyms and i feel better for it. Headed out to the garage to lift. Needed a kick in the pants from my trainer! Sometimes I feel like “letting it all go”. At age 58, one can have a “slow” morning. Gotta fight the inertia. Thanks for the word Ross. So true, l love the spirit of american people. Here in my country there is nothing to see with the way you practice. Ross – I’ve been following your site for years and have purchased most of your books and although I’ve tried out every routine on the planet, I have to say that I constantly return to your thoughts and ideas as the principle of inspiration for continued fitness. I think you’ve really nailed it down in this post – fitness is about simplicity – though sometimes the complexity of putting together/trying new routines can help to keep the spirit from burning out! But heck, I think this year should be about having fun. Great article! I like it very much. I to fall in the category wereby i surch the forums everyday to find some new routines witch i know i dont follow. I dont have the space to train with weights, i do have a pull up bar, dip station, a sandbag and a heavy bag to kick and punch. I am a little bit older to, 54, and train martial arts since the age of 15. I like the way that friend of ross train because i want to put it all in one workout and that doesnt work. One day running, one day bodyweight and one day kicking and punching, shadow boxing etc. But i dont know what kind off exercises etc. I do like to do the first stes witha weghted vest and the some sets without but i dont know how that work, how many sets/reps with vest, how many without, witch exercises etc. As i said i like this kind of training very much but dont know were to start. I think when i have a basic routine i can work from there. So maybay there is someone here who can help me out. I dont have hours a day to workout so i am curious how many hours of that friend of ross workout a day to. Hope i can get some information from you guys. HI ROSS, IN THIS DAY AND AGE THIS MESSAGE CANNOT BE REPEATED ENOUGH. AS A KID OF 10 I WOULD RUN UP TO THE MOORS ON THE OUTSKIRT OF TOWN TO AN OLD STONE QUARRY AND LIFT AND THROW ROCKS. I DID THAT FOR TWO YEARS BEFORE JOINING AN OLD SCHOOL GYM. OVER THE YEARS I HAVE BOXED, LIFTED, WRESTLED AND PRACTICED MARTIAL ARTS ETC. HOWEVER I HAVE NO DOUBT AT ALL IF I HAD CONTINUED TO RUN ON THE MOORS AND LIFT AND THROW BIGGER AND BIGGER ROCKS I WOULD HAVE BEEN AS FIT AND STRONG AS MY POTENTIAL ALLOWED. AT 64 I DO SOME ACTIVITY OF VARIED INTENSITY EVERYDAY AND CANNOT FORSEE AT TIME WHEN I WILL NOT. THERE IS SOMETHING FOR EVERYONE, SIMPLE WORKS. The days I really don’t feel like working out b/c I feel too tired or body aches, seems to be the days I set personal records. Can’t explain it other than the body lies to the mind. He doesn’t really care about periodization, but from the sequence of strength – anaerobic – aerobic he really does it all right.